On Thursday while Americans feast on turkey on Thanksgiving Day, Pope Francis prepares for his three-day Apostolic Journey to Turkey for another kind of feast: of ecumenical relations, interreligious dialogue and peace. Breaking another record for papal trips, Pope Francis on Friday sets off on his second international journey this week alone, travelling to the Turkish cities of Ankara and Istanbul. 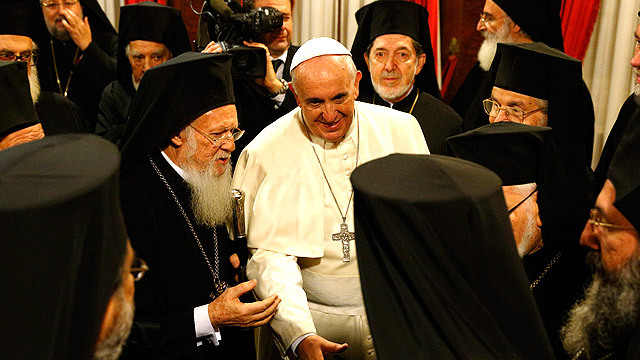 Just three days after his trip to Strasbourg for meetings with the European Parliament and Council of Europe, the Pope is responding to the invitation of both the government of Turkey and the Ecumenical Patriarch Bartholomew, spiritual leader of the Orthodox world. 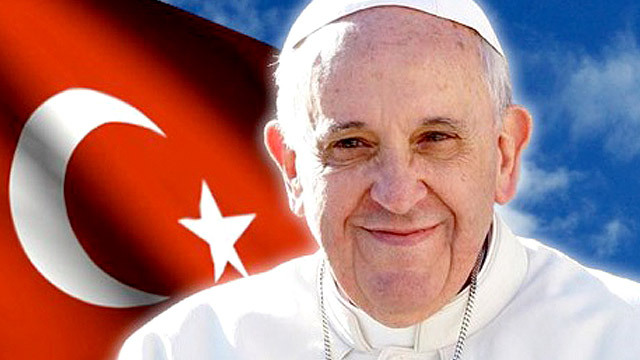 Francis is the fourth pope to travel to Turkey, following in the footsteps of his predecessors, Paul VI, John Paul II and Benedict XVI, while Archbishop Angelo Roncalli is also remembered with great affection by the Turkish people, as he served as apostolic delegate there for nine years before being elected Pope John XXIII. Let us join Pope Francis in praying that "Peter's visit to his brother Andrew may bring fruits of peace, sincere dialogue between religions and harmony in the Turkish nation." The official meetings of the Primates of the Churches have always been ecclesiastical events of great importance, for the reinforcement, and hopefully, the restoration of the unity of faith in the nexus of love. Such visits are in accordance with the commandment of the Divine Founder of the Church, our Lord Jesus Christ. The Ecumenical Patriarchate, with its open and ecumenical spirit, developed a series of ecumenical initiatives of historical importance in the well-known Encyclicals of 1902, 1904 and 1920. 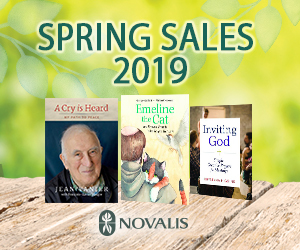 These encyclicals aimed at the unity of all Christians in the communion of faith and sacraments. These initiatives of the Ecumenical Patriarchate have led to a Theological Dialogue of the Orthodox Church with the sister Roman-Catholic Church "on equal terms." It has been the goal that beyond all other fraternal gestures, the mutual visits of Popes to Constantinople and Ecumenical Patriarchs to Rome have marked a new era in the relations between the two Churches. It has helped in the understanding of the people of God, that there be effort, from both sides, for the achievement of the unity, so "that all may be one", according to the words of the Lord in His High Priestly Prayer (John: 17). During the first millennium, there were no visits of the Primate of Constantinople to Rome, because New Rome had become the capital of the Empire. In 536, Pope Agapetus of Rome accompanied by five bishops, visited Constantinople on a diplomatic mission for the Ostrogoth King Theodahad of Italy. Vigilius, who was a Papal representative in Constantinople before his election as Pope, ascended the Papal Throne of Rome with the assistance of the Empress Theodora. Pope Vigilius came to Constantinople in 547 during a period of theological upheaval. He returned again in 552, but died before he could return. The Papal Throne was not officially invited and did not participate in the Quinisext Ecumenical Council, which was convened for the institution of Canons. Pope Constantine went to Constantinople with an entourage of clergy and laity, where he was welcomed with great honours. He then departed for Nicomedia, where he met with Emperor Justinian II. Pope Constantine recognized under these terms the Quinisext Ecumenical Council and returned to Rome in 711. The Emperor of Byzantium John VIII Palaiologos headed the mission of the Orthodox that would discuss the issue of the reunification of the Churches in the Council of Ferrara-Florence (1438-1439). Among the members of this delegation was Patriarch Joseph who was accompanied by many hierarchs. During his meeting with the Pope in Ferrara the protocol that demanded kissing the foot of the Pontiff was not followed, and so they exchanged the kiss of peace standing. The main goal of the Orthodox delegation in this Council was to accomplish the union of the Churches without surrendering in matters of faith. Nevertheless, even from the preliminary discussions, the Orthodox were divided in two groups: the ones who were in favor of the union and those who were against it. This division grew even more after the transfer of the Council to Florence. Patriarch Joseph was hesitantly following the unionist policy of the Emperor, who was interested mainly in securing military aid from the West, in order to save the state from the Ottoman threat. The participation of Patriarch Joseph in the work of the Council was limited, because he suffered from dropsy, whereas most of the Orthodox bishops refused to surrender in matters of faith. The Emperor, watching this situation, was worried about the outcome of this Council and he pressured the bishops for a conciliatory signing of the union. 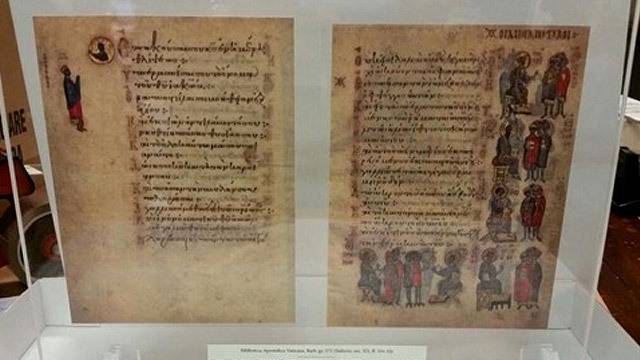 In the end, the Synodical members of the Eastern Church, with the exception of Mark of Ephesus, Eugenikos, came together in the residence of the ill Patriarch and signed the document of the unification (3 June 1439). After a few days, but before the Council of Florence came to an end, the ill Patriarch Joseph passed away and was buried in the Church of Santa Maria Novella. The so-called Union of Florence was never accepted in the East. This Patriarch from Epirus, Greece with his discernment, his diligence, hard work and the spirit of love that distinguished him, gave new inspiration to the ecumenical mission of the Patriarchate of Constantinople. Besides his primary interest for the improvement of the relations of all Orthodox Churches, he worked with intense zeal and dedication for the rekindling of the relations of the Orthodox with the other Churches. From the illness of Pope Pius XII that led to his death on October 9, 1958, and through the entire reign of Pope John XXIII, Patriarch Athenagoras expressed his friendly intentions, his fraternal feelings and his genuine interest for the rapprochement of the two Churches. Alongside the numerous exchanges of letters, there had been frequent mutual visits in Constantinople and Rome of the members of pertinent Committees for the promotion of the issue of unification. The relations between the two Churches began to make slow but firm steps of progress. When Patriarch Athenagoras was informed about the dire state of the health of Pope John XXIII, he sent a telegram (30 May 1963) wishing for a fast recovery. The passing away of the elder Pope John XXIII of Rome deeply saddened him. Paul VI, who ascended the Throne of Rome after Pope John XXIII, continued the efforts for better relations between the two Churches. The Patriarch was informed also officially by a Papal delegate, (9 December 1963) about an upcoming pilgrimage of the Pope to Jerusalem. The Patriarch wrote to the Pope (26 December 1963), telling him of his desire to meet with him in Jerusalem. With a telegram to the Patriarch (30 December 1963), the Pope expressed his joy about their upcoming meeting. The Primates of the two Churches met in an atmosphere of joy and excitement on the Mount of Olives in Jerusalem, where they exchanged the kiss of peace. Patriarch Athenagoras in addressing Pope Paul VI during his visit to the Delegation of the Holy See to the Mount of Olives (5 January 1964) described their meeting as historical and blessed, and he added: "the Christian world lived for centuries the night of division. Its eyes have become heavy by looking at the darkness. May our meeting here become the twilight of a shining and holy day, in which the Christian generations to come, will receive the sacred body and blood of our Lord from the same Cup, in love and peace and unity, praising and glorifying the one Lord and Savior of all." In his reply, Pope Paul VI during his visit to the Patriarchal residence in the Mount of Olives (6 January 1964) referred to the unrealized wish of the Patriarch for a meeting with his predecessor, Pope John XXIII due to the untimely death of the latter. He highlighted the fact that their present meeting bore witness to the will "that brings us to the very skillful task of overcoming the discords and removing obstacles; for it is this will, to follow steadily the way that is acknowledged by all, that leads towards concord and reconciliation." After these auspicious ecclesiastical events, Pope Paul VI wrote a letter to Patriarch Athenagoras (13 July 1967) expressing his desire to visit the Phanar "in order to strengthen the bonds of faith, love and friendship." The Patriarch welcomed with excitement this historical decision, and the Pope went to Constantinople on 25 July 1967. In his address to Patriarch Athenagoras, in the Patriarchal Church, he noted: "In the light of our love to Christ and in our fraternal love to one another we discover even more the deep identity of our faith, and the points in which we still disagree, must not prevent us from comprehending this deep unity." In his reply, Patriarch Athenagoras, underlined as their main goal: "to join that which is divided, with mutual ecclesiastical actions, wherever that might be possible, affirming the common points of faith and rule, directing thus the Theological Dialogue to the beginning of a wholesome community, in the most foundational of faith and of the devout and structural freedom of theological thought, that has been inspired by our common Fathers, and of the variety of local traditions, as it has been pleasing to the Church from the very beginning." Following this historical and successful visit of the Pope to the Ecumenical Patriarchate, Patriarch Athenagoras notified the Pope with a letter (6 October 1967) of his desire to visit Rome. This visit took place on 26 October 1967. Pope Paul VI and Ecumenical Patriarch Athenagoras at the Basilica of St. Peter, 1967. In the common declaration of the two Church leaders that was issued at the end of the Patriarch's visit to Rome (28 October 1967), it was stressed that "while recognizing that in the journey towards the unity of all Christians there is still a long way to go, and that between the Roman-Catholic and Orthodox Churches there still exist points to be clarified and obstacles to be overcome before arriving at the unity in the profession of faith which is necessary for reestablishment of full communion, they rejoice at the fact that their meeting has played a part in helping their Churches to make a further discovery of themselves as sister Churches." On 30 November 1979, the feast day of the Holy and Glorious Apostle Andrew, the First-Called, and also Feast Day of the Throne of the Ecumenical Patriarchate, Pope John Paul II of Rome, of blessed memory, together with his entourage, visited the Ecumenical Patriarchate and attended the Divine Liturgy that was celebrated in the Patriarchal Cathedral. The Pope was welcomed by Patriarch Demetrios of blessed memory, together with all the Synodical and local Hierarchs, as well as with other Hierarchs from abroad. Pope John Paul II and Ecumenical Patriarch Dimitrios, November 30, 1979. In the Joint Declaration of the Pope and the Patriarch, which was issued in the Phanar on 30 November, after the end of the discussion of the two Primates and with the participation of memebers of the two Commissions on the Dialogue, they stressed their gratitude to their predecessors, Pope Paul VI and Patriarch Athenagoras. They stated that the Theological Dialogue does not aim only at the restoration of full communion between the two sisters Churches, Roman-Catholic and Orthodox, but also at the unity of the entire Christian world. To reciprocate the visit of Pope John Paul II of Rome to the Ecumenical Patriarchate on 29-30 November 1979, Patriarch Demetrios visited the Church of Rome from 3 to 7 December 1987. His stay in Rome affirmed the will of the Patriarch and of the Church in Constantinople to strengthen the relations from both sides and the bonds of love for reconciliation and unity. This visit was not simply one of etiquette. It was an historic meeting of the Primates of the Churches of the East and West, as well as a message that was addressed to the entire world. It coincided also with the anniversary of 1200 years from the convening of the 7th Ecumenical Council in Nicaea in 787 that led to the triumph of the Orthodox faith. The Pope and the Patriarch, together from the Balcony of Blessings, addressed a greeting to the people who had gathered on St. Peter's Square. After his election and enthronement on the Patriarchal Throne of Constantinople, Ecumenical Patriarch Bartholomew visited the Church of Rome with his entourage from 27 to 30 June 1995, in order to participate in the festivities of the Feast Day of the Throne of Rome. The Patriarch was welcomed by a numerous delegation of Pope John Paul II of Rome, of blessed memory. During his stay in the Church of Old Rome, the Ecumenical Patriarch visited the Community of Saint Egidio, the Basilica of Santa Maria in Trastevere, the Basilica of St. John of the Lateran, as well as the homonymous Pontific University. He visited also the French Seminary, where he stayed during his Post-Graduate studies (1963-1966). On 29 June, the Feast Day of the Holy Apostles Peter and Paul, the Ecumenical Patriarch attended together with his entourage, the festive Divine Liturgy that was celebrated by the Pope, in the Basilica of St. Peter. After the reading of the biblical passages, the two Primates, recited the Creed in Greek without the addition of the Filioque. In the evening of the same day, in the residence of the Ecumenical Patriarchate in the Tower of St. John, the two Primates signed a Joint Declaration on the end of the visit of His All Holiness to the Pope. In this Declaration, they commended the initiatives of their Predecessors, of blessed memory, Patriarch Athenagoras and Pope Paul VI, and their meetings in Jerusalem, and later on in the Phanar and in Rome for the lifting of the old anathemas, the peace of the Churches, and reconciliation; they also referred to the mutual visits of Pope John Paul II and Patriarch Demetrios for the encouragement of the Dialogue of love and truth, which was proven very fruitful. It was therefore possible for this dialogue to continue in an effective way and to proclaim that the two Churches recognize each other as Sisters, jointly responsible for the preservation of the One Church of God, in faith to the divine plan, especially in the matter of unity. On 23 January 2002, His All-Holiness, Ecumenical Patriarch Bartholomew, together with His entourage, visited Rome once again. The following day, 24 January, he participated in the Day of Prayer for Peace, organized by Pope John Paul II of Rome. This Prayer Day took place in Assisi, and among the participants were His Beatitude, Patriarch Ignatius of Alexandria, and His Beatitude, Archbishop Anastasios of Albania, as well as representatives of many other Orthodox Churches and numerous representatives of many denominations and religions. During this event, the Ecumenical Patriarch prayed for peace in the world and gave a speech on "Testimony to Peace." 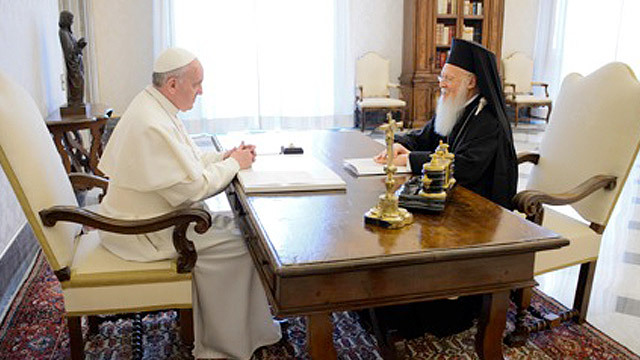 On 25 January, the Ecumenical Patriarch had a private meeting with the Pope. The third visit of His All-Holiness, Ecumenical Patriarch Bartholomew to the Church of Rome took place after the official invitation from Pope John Paul II, of blessed memory, to participate in the Feast Day of the Throne of the Church of Rome, and to celebrate the 40th Anniversary from the historical meeting of their predecessors in the Holy Land. In the evening of 29 June, the Ecumenical Patriarch, together with his entourage, attended the Divine Liturgy that was celebrated by the Pope, in honor of the Firsts among the Apostles, Peter and Paul in the square of the Basilica of St. Peter. The two Primates exchanged the kiss of peace and blessed the faithful who were gathered there. The Vatican Common Declaration of the two Patriarchs took place on the 40th Anniversary of the meeting of the Primates, of blessed memory, of the two Churches, Pope Paul VI and Patriarch Athenagoras in Jerusalem. Ecumenical Patriarch Bartholomew and Pope John Paul II sign the Common Declaration at the Vatican. In the morning of Wednesday, 30 June, the official bilateral discussions of the Delegations of the two Churches took place. His All-Holiness, expressing a Pan-Orthodox request, asked the Pope for the return of the Holy Relics of the Holy Patriarchs and Great Teachers of the Undivided Church, Gregory the Theologian and John Chrysostom to the Church of Constantinople, a request that was granted during the fourth visit. On Friday, 26 November, His All Holiness, the Ecumenical Patriarch Bartholomew traveled, together with his entourage, to the Church of Rome in order to receive, by the Primate of the Roman-Catholic Church, Pope John Paul II, of blessed memory, the Holy Relics of the two Holy Hierarchs, Great Teachers of the Undivided Church, and His Predecessors on the Throne of the Holy and Great Church of Christ in Constantinople, Gregory the Theologian and John Chrysostom. The Sacred shrines of the two Holy men were kept in the Venerable Church of the Holy Apostles in Constantinople until 1204, when they were removed and taken away by the Crusaders and were brought first to Venice, and later on to Rome, to be safeguarded in the Venerable Church of St. Peter. Pope John Paul II and Ecumenical Patriarch Bartholomew at the ceremony returning the relics of St. John Chrysostom and St. Gregory the Theologian to the Ecumenical Patriarchate. On the morning of 27 November, during a fitting ceremony in the Basilica of St. Peter, the Pope himself, of blessed memory, handed over the Holy Relics of the two Holy Fathers to His All Holiness for their return to their home, after the passing of eight whole centuries. The Holy Relics, on their journey from Rome to Constantinople, were accompanied by the Ecumenical Patriarch and his entourage, together with an official Pontific Delegation, headed by Cardinal Walter Kasper, who attended the Feast Day of the Throne of the Ecumenical Patriarchate on 30 November. Late in the evening on Saturday, 2 April 2005, Pope John Paul II of Rome, fell asleep in the Lord, after a long illness. The same evening the Ecumenical Patriarchate issued an official Statement on the passing away of His Holiness. His All-Holiness, together with His entourage, went to Rome in the evening of Thursday, 7 April, in order to personally attend the following day the funeral service for His Holiness, with whom he had met four times in the last decade and had cooperated closely to promote relations between the two Churches. The Patriarch, after arriving at the airport, went straight to Saint Peter's Basilica, where he prayed in front of the deceased, who was lying in state for the people to pay their last respects to the Pope of blessed memory. The Patriarch placed on the body of the Pope a cross of white flowers. 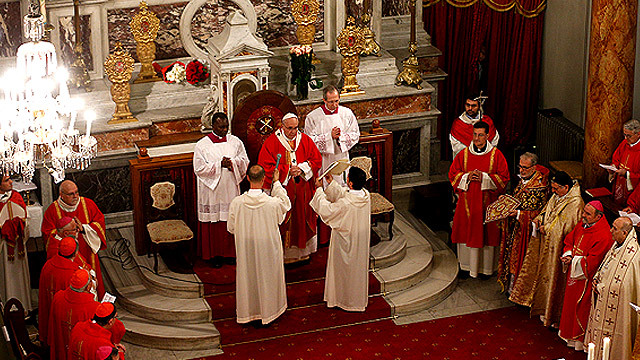 In November of 2006, the official visit of His Holiness, Pope Benedict XVI of Rome to the Phanar during the Feast-day of the Throne of the Ecumenical Patriarchate, continued this radiant tradition of the past decades. Pope Benedict XVI continued the work of his predecessors, initiating this visit shortly after his enthronement on the Apostolic Throne of Rome, after the official invitation of His All-Holiness, the Ecumenical Patriarch Bartholomew, to attend the festivities on November 30, the Feast Day of the Holy and Glorious Apostle Andrew the First-Called, the Feast Day of the Throne of the Holy and Great Church of Christ in Constantinople. Pope Benedict and Ecumenical Patriarch at the Phanar, November 30, 2006. This visit to the Ecumenical Patriarchate, the leading Church in the Orthodox world, of His Holiness, Pope Benedict XVI of Rome, who is a profound Theologian and a renowned University Professor and who knows well the Orthodox Church and Theology, constituted a point of hope for the reinforcement of the climate of mutual trust between the two Churches, as well as for the successful continuation and outcome of the Theological Dialogue which aims at the unity of the Churches, when the Lord will grant it. His All-Holiness was invited by Pope Benedict XVI to attend the 3rd interfaith peace summit, which was held in Naples. Previous summits were in Assisi by Pope John Paul II (1986 and 2002). On the occasion of the 90th anniversary of the Oriental Pontifical Institute, where His All-Holiness Ecumenical Patriarch Bartholomew completed his doctoral studies in canon law, the Ecumenical Patriarch was invited to address the faculty and students of the institute on the subject of "Theology, Liturgy and Silence." He also visited Pope Benedict XVI at the Vatican, where he held private conversations and joint prayers in the papal chapel. On the occasion of the official inauguration of the Pauline Year, His All-Holiness attended the vesperal service at the abbey of St. Paul Outside-the-Walls. For the first time in history, at the invitation of the Pope of Rome, the Ecumenical Patriarch addressed the Synod of Roman Catholic bishops in the Sistine Chapel at the Vatican. The subject of the address by Ecumenical Patriarch Bartholomew was: "The Word of God in the Life and Mission of the Church." For the full text of the Ecumenical Patriarch's address, click here. His All-Holiness attended and addressed the 4th interfaith peace summit, which was hosted by Pope Benedict in Assisi. In October of 2012, His All-Holiness, Ecumenical Patriarch Bartholomew traveled, together with his entourage, to the Church of Rome on the occasion of the 50th Anniversary of Vatican Council II. At the invitation of the Pope, His All-Holiness addresses the crowds at St. Peter's Square. Ecumenical Patriarch Bartholomew and Pope Benedict XVI at the Vatican, 2012. His All-Holiness Ecumenical Patriarch Bartholomew becomes the first Ecumenical Patriarch to ever attend the installation of a Pope. 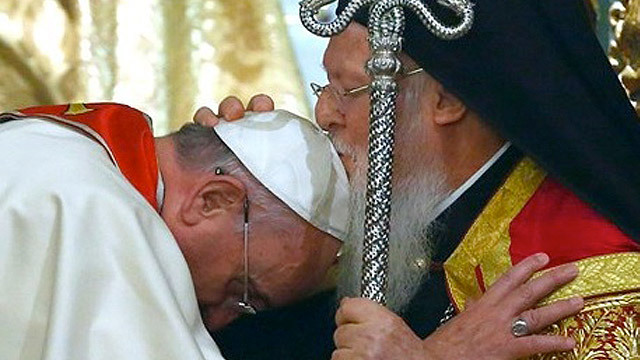 Pope Francis and Ecumenical Patriarch Bartholomew at the Vatican after Pope Francis' installation as Pope. Now once again, Pope Francis and Ecumenical Patriarch Bartholomew will meet in Jerusalem to commemorate the 50th anniversary of their predecessors' meeting. This meeting of the venerable Primates of the leading Sees of Christendom has great significance. 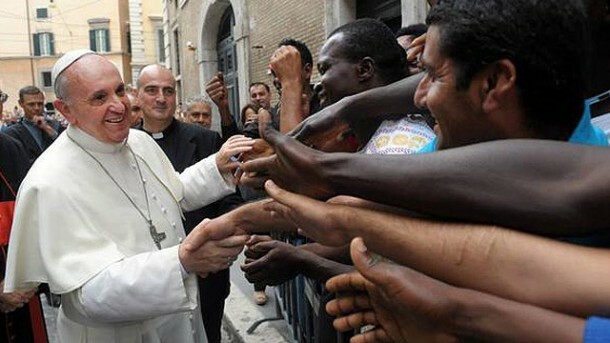 On the one hand, because is constitutes the unanimous recognition of the fruitful Dialogue of Charity for the relations of the two Churches, and on the other hand, because it lights, through the validity of their exemplary authority, the way of the official Theological Dialogue for overcoming the traumatic experiences of the past. This common course in the way of unity is a command of the divine Founder of the Church, our Lord Jesus Christ, and it is the common mission of the venerable Primates of the two Churches. Information courtesy of Vatican Radio SEDOC.